This book was written to reveal the Christian heritage of New Zealand, and to show how God has blessed the nation. Learn how James Cook, Samuel Marsden, George Gipps, William Hobson, Hone Heke, Tamati Waka Nene, Te Kooti and others spoke of their faith. 192 pages. 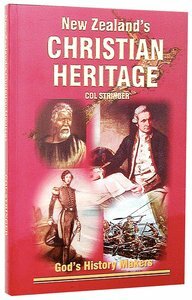 About "New Zealand's Christian Heritage"
Col Stringer is the son of a professional hunter, born in the rugged desert country of Australia. During his life in the Northern Territory Col was awarded the Mariner Fishing Writer of the Year award (Australia) (1979), won a Swedish Gold Medal for a world record shark capture, and was featured in an outdoor documentary film for Australian and American television. Col also successfully hosted his own outdoor and fishing TV program and has written 10 books on fishing, hunting and wildlife. His book The Saga of Sweetheart, about a true story of a giant rogue crocodile has become a best seller. The Stringers minister with a powerful anointing and are in great demand to speak at churches and conventions in many parts of the globe. Col's unique background of wildlife and humour have won for him the title of "Pastor Crocodile Dundee". He is also a very successful author of 20 Christian books, with total sales of 300,000. Two of his books 800 Horsemen and Fighting McKenzie were voted number 12 and 29 in the Australian Broadcasting Commissions 100 All-time favourite books, beating such books War and Peace, Wuthering Heights and even one of the Harry Potter books, the only Christian books (except the Bible) in the top 100.